When Ray Eddy’s husband flees the hardscrabble town of Massena in upstate New York, he steals Ray’s hard-earned down payment for a new doublewide trailer home. Faced with eviction, Ray has to come up with an impossibly large sum of money to keep a roof over her sons’ heads. Ray unwittingly becomes involved with Lila, a young widow on the nearby Mohawk reservation who smuggles. Lila has resorted to smuggling to keep herself fed and to earn money to reclaim her baby boy who has been taken from her. Ray and Lila form an uneasy alliance as they drive from the rez across the frozen St. Lawrence River to Canada where they pick up illegal immigrants. 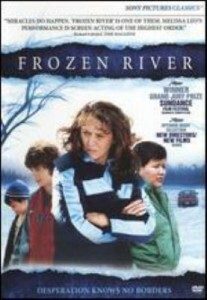 A paean to single mothers whose love for their children sometimes drives them to desperate measures, Frozen River will touch your heart. This entry was posted in Mary K. and tagged drama, movie on July 1, 2016 by jamiea.